There is exciting news for anyone who wants to build a compact rig gaming based on the latest AMD Ryzen processor support, the recent article ASUS ROG presents its latest AM4 Mini-ITX gaming motherboards as well as ROG STRIX X370-I GAMING (AMD based chipset X370) and ROG STRIX B350-I GAMING (based on AMD B350 chipset). Both motherboards have very similar specifications and are ready for use on the liquid cooling (liquid) system that became its flagship. In addition to having a customizable RGB lighting system, the two gaming motherboards are also equipped with integrated M.2 SSD heatsinks and the best audio components that have been perfected with a riser card so as to produce audio that sounds better than most current ITX mini motherboards . Other features include integrated Aura Sync, WiFi 802.11AC, USB 3.1 ports, and FanExpert technology that lets the machine stay dingindan as it should be. 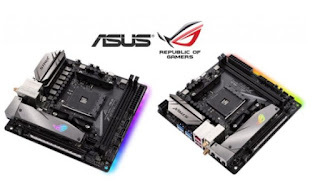 And even to get around the limitations of small dimensions with the existing mini-ITX form factor, ASUS is said to have presented a riser card support to keep the features that gamers want. This caring audio riser has an M.2 Audio Combo card with SupremeFX sound and an additional slot for M.2 storage expansion. The small riser board is crammed between heatsinks for M.2 drives and platform chipsets so they can be efficiently cooled without taking up excess space inside the device. 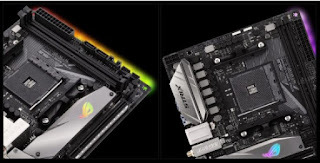 Both ROG STRIX X370-I GAMING and ROG STRIX B350-I GAMING motherboards can utilize Ryzen overclocking with a six-phase VRM design as offered by full-sized ASUS motherboards in general. Both have a shorter footprint for dual-DIMM RAM configurations that allow support for DDR4-3600 RAM. Not only that, ASUS reportedly also has integrated 5-way Optimization that makes overclocking easier to do by beginners or even experts. The smart auto-tuner will automatically overclock the CPU and configure the cooling depending on the components you use during assembly. Alluding to its availability, the two gaming motherboards made by ASUS is reportedly will soon menyambangi North American market in late October to come. As for the price itself, unfortunately can not be known so far considering the determination of price-dependent market in each region.